SODES rallies its members around joint positions on key issues relating to the St. Lawrence River’s economic development. SODES sits on various committees and participates in numerous forums on an ongoing basis. The association is also a regular contributor to various activities related to the marine industry and the St. Lawrence River. CargoM’s mission is to bring together all players in the logistics and freight of Greater Montreal, whose activities promote the hub of Montreal, around common goals and concerted actions to increase the cohesion, competitiveness, growth and expansion. Nicole Trépanier, SODES President and Chief Executive Officer, co-chairs CargoM’s Working Group II, called Communications and Outreach. This working group’s mandate is to to establish effective, ongoing communication between all levels of government, the general public and stakeholders, on the economic spinoffs of the transport and logistics sector for Greater Montréal. SODES sits on the community relations committee created by the Port of Québec to establish and maintain formal communication channels between the port and the community stakeholders concerned by its activities. The committee also seeks to improve the manner in which port projects are carried out in order to enhance their social acceptability. SODES continues to support Green Marine in pursuing its objectives by sitting on the St. Lawrence environment advisory committee in order to study Green Marine’s program so as to improve it and develop new indicators. The Institut France-Québec pour la coopération scientifique en appui au secteur maritime (IFQM), mandated to promote scientific cooperation to support the maritime sector, seeks to channel bilateral efforts and mobilize stakeholders, on both sides of the Atlantic, involved in the various fields related to the maritime sector with regard to research and innovation. In the current global context, transatlantic coordination of scientific cooperation efforts to serve the maritime economy is becoming increasingly necessary. SODES is a member of the IFQM’s Steering Committee. Set up in 2016, the Quebec Maritime Network (RQM) aims at providing Québec with a consultation and cooperation maritime research tool. In a spirit of knowledge-sharing and integration, the RQM promotes Quebec’s existing structures and experts and helps companies, governments, government departments and municipalities access a critical mass of researchers from various research groupings and institutions throughout the province. In accordance with the first Québec Maritime Strategy, this initiative contributes to Québec’s sustainable development. SODES sits on the Steering Committee as the marine industry representative. The Forum is co-chaired by the Minister for Maritime Affairs, Jean D’Amour, and the SODES Chairman of the Board, Michel Tosini. SODES partners with Transports Québec’s Maritime Transportation and St. Lawrence Promotion De­partment to run the Forum secretariat. The Maritime Information System (MIS) working group helped complete the creation and implementation phase of the MIS platform, which has been operational since December 2017. The Forum set up a working group to analyse the competitive position of St. Lawrence ports in terms of water depth available in the ship channel. 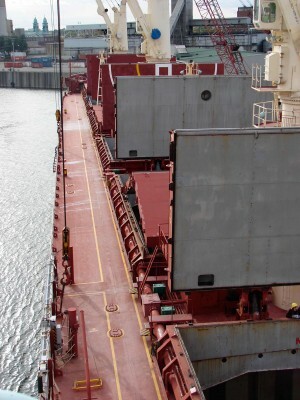 The working group’s mission is to recommend an action plan aimed at enabling St. Lawrence ports and the Seaway to receive bigger ships by taking into account the economic, environmental and social dimensions of the issues raised. The group’s work continued in 2017. The National Marine Advisory Board advises the Canadian Coast Guard (CCG) Commissioner and studies the services the organization offers its clients. 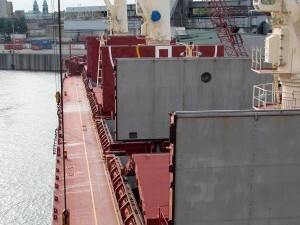 It is mandated to create a permanent forum for discussion between the CCG and the Canadian marine industry. The NCC committee was put together as part of the St. Lawrence Action Plan, created by Canada-Quebec collaboration on the St. Lawrence River. The committee consists of 25 representatives from the maritime industry, recreational navigation, environmental groups, provincial and federal ministries. A second edition of the SNS should be available soon. For each of the issues identified in the 2004-2011 action plan, the NCC reported on the work that had been done and the work that must be done in the future for all stakeholders. The North Atlantic right whale working group, composed of members from the shipping sector, governments, and the research community, has made it possible to find a solution to the problem of North Atlantic right whale mortality due to ship strikes. Part of the group’s work led in scenarios that influenced the speed restriction measure targeting vessels over 20 metres in length implemented in the Gulf of St. Lawrence in spring 2018. SODES participates in the meetings of the Regional Marine Advisory Council organized by Transport Canada and the Canadian Coast Guard in order to inform industry stakeholders of the Marine Advisory Board’s work – Quebec region and the progress made on regulation and legislation-related files. SODES presented a report on the Marine Advisory Board – Québec Region’s work at the meeting. SODES participates in the work of the Trade and Economic Vitality Working Group of the Regional Round Table on Integrated Management of the St. Lawrence. It seeks to promote joint efforts between the regional stakeholders concerned by specific issues related to the St. Lawrence, and contribute to the development, adoption, implementation and follow-up of an integrated regional management plan (PGIR), with the collaboration of the different actors. As part of this working group, a description of the economic activity related to the St. Lawrence for the Québec region will be provided. Created by the Ministère des Transports, de la Mobilité durable et de l’Électrification des transports to successfully develop the sustainable mobility policy and have a long-term vision of all of the different issues, the advisory committee was mandated to accompany the department through the process. Composed of thirty members from all horizons, the advisory committee members issued recommendations on the measures proposed by the department at each stage in the policy development process.